With a name as illustrious as Black Dragon Pool, it’s unsurprising someone would try to reuse it. There are in fact two Black Dragon Pools in Yunnan alone; one in Kunming and one in Lijiang. However, while the legend behind Kunming’s pool recounts the deeds of 10 nefarious black dragons; its counterpart in Lijiang is named in honour of the Dragon God. In ancient Chinese mythology this deity, known originally as Longwan but now as Longshen, controlled rainfall and was thus an important figure back when China was an agricultural civilization. Yet, in spite of China’s technological advancement and secular government, these ancient gods still play a significant role in the everyday lives of many Chinese people. After all, if it worked for their ancestors, who’s to say it won’t work for them! Lijiang’s Black Dragon Pool is located in Jade Spring Park just north of Lijiang Old Town. Its scenic location at the foot of Elephant Hill, with the Jade Dragon Snow Mountain looming in the distance, is what has earned the park so much fame throughout Yunnan. From the white marble Suocui Bridge that stretches over the wide expanse of the pool, the view of this snowy mountain amongst the wispy clouds has become iconic and now features as one of the must-see attractions in Lijiang. Throughout summer and autumn, the park is alive with the milky white blossoms of the aquatic Gagnepain Dandy flowers floating on the water and the luxuriant old chestnut trees hanging over the banks. In the east of the park, you’ll find the Longshen or Dragon God Temple. This temple was constructed by the local Naxi people in 1737, during the Qing Dynasty (1644-1912), and was given the name “Dragon God Temple” by Emperor Qianlong who, after visiting the temple, believed that the Dragon God lived there. The temple consists of five courtyards, a gate-house flanked by two wing-rooms, and a great hall. The courtyards are bedecked with splendid flowers befitting the God of Rain himself. The great hall is used by locals to host sacrificial rituals and pray for rain. If you’re lucky, you may even catch a few of the Naxi people singing or playing traditional instruments. These age-old songs pierce through time, linking the Naxi people to their ancient past. At the centre of the Black Dragon Pool, connected to the shore by an elaborately carved marble bridge, you’ll find the Moon Embracing Pavilion. It was originally built during the Ming Dynasty (1368-1644) but was tragically destroyed in a fire and rebuilt in 1963. How a building surrounded by water managed to catch fire we do not know, nor do we know how this pavilion manages to embrace the moon from its rather rooted position here on earth, but what we do know is this restored pavilion provides a wonderful view of the pool’s crystal clear waters. Towards the north end of the park, the magnificent Five-Phoenix Tower overlooks the northern entrance. This 23-metre-tall tower was built in 1601, during the Ming Dynasty (1368-1644), but was originally located at the Fuguo Temple, 30 kilometres to the west of its current location. 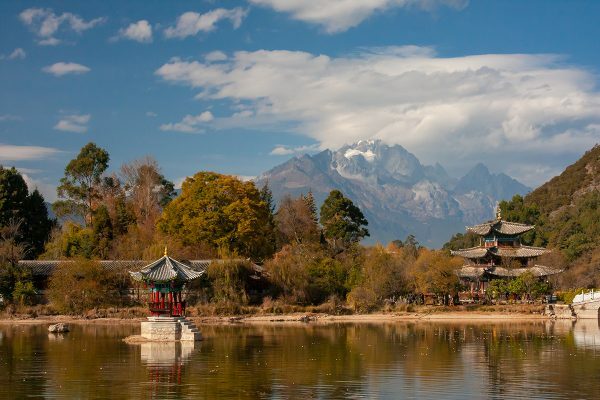 It was relocated to the Jade Spring Park in 1979 and has since become one of the focal features of Lijiang. It is a marvel of Naxi construction, combining features of Naxi, Tibetan, Bai, and Han style architecture. It is luxuriously decorated with colourful paintings and elaborate carvings, and is so-named because from a certain perspective five beautiful cornices are visible on either side of the tower. When you visit the Black Dragon Pool, be sure to stop off at the ancient Naxi stage. It’s one of the oldest stages in Lijiang and is housed within an unusual triangular shaped building. Performances are held regularly on the stage and, if you’re feeling particularly brave, the locals will surely welcome a performance from you too! Just outside of the park’s northern entrance, there’s the Dongba Culture Research Institute and Dongba Culture Museum. These two establishments are dedicated to the research and preservation of the Dongba religion, part of the Naxi ethnic minority’s cultural heritage. The Dongba script, the last known hieroglyphic writing system still in use, is particularly magnificent and it’s certainly worth making a stop at the museum to marvel at some of the ancient sacred texts on display.